Escape to a world of peace and tranquility at this updated 3BR/2BA wooded home on Bainbridge Island. Sip morning coffee on the stone patio, or spread out in the grassy backyard. Spend quiet mornings paddling on Fletcher Bay with the two new kayaks provided; kayak ramp access is just a short walk from your front door. Or pay a visit to the 150-acre Bloedel Reserve for views of Puget Sound, glimpses of wildlife, and breathtaking gardens. When you’re ready to hit the town, discover wineries and distilleries within 2 miles, or take the Bainbridge Island ferry to Seattle’s theaters, shopping, and iconic Pike Place Market. 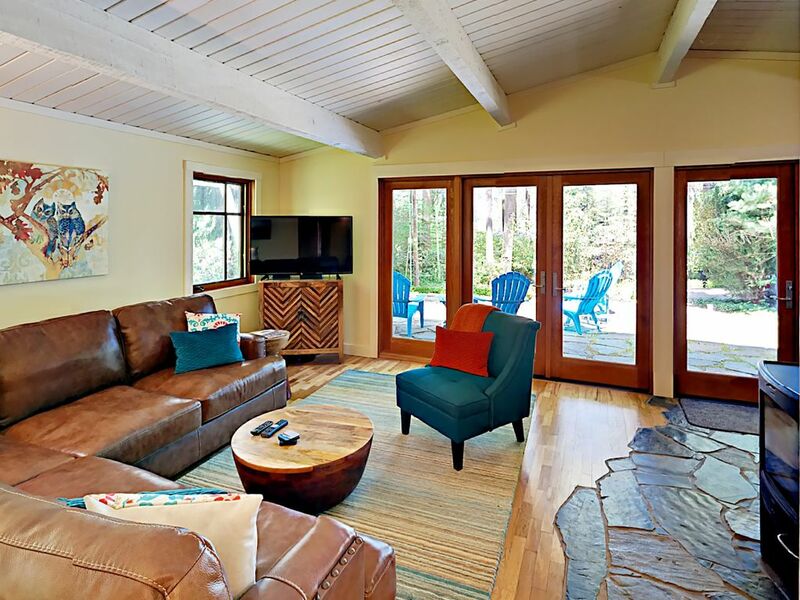 Guests can kick back in the living area to watch movies on a 50” flat screen TV, or cozy up on the leather sectional and enjoy the warmth of the wood-burning fireplace. All furniture is brand-new, as is the carpeting in the bedrooms. A glass door leads to a generous backyard where the little ones can run and play. Prepare home-cooked meals in a modern kitchen with a full suite of stainless steel appliances, including a French door refrigerator. Dine at a circular wood table with fine upholstered seating for four or add the table leaf to sit six. An elevated stone patio overlooks a peaceful, wooded front yard, where deer can frequently be seen. Quiet and secluded, the space is perfect for sipping morning coffee or evening cocktails from four Adirondack chairs. Three bedrooms sleep five guests. With a full closet and a modern wood chest of drawers, the master bedroom offers plenty of space to unpack and make yourself at home. Kick back in a plush king bed to watch your own flat screen TV, and refresh in an en suite bath with dual vanity, skylight, and tub/shower combination. Neutral tones and warm wood accents invite you to relax in the second bedroom, which includes a queen bed, full closet, and corner windows overlooking the lovely yard. The third bedroom features a full bed, a flat-screen TV, and a quiet workspace that’s ideal for catching up on some emails. A guest bathroom in the hallway features a tub/shower combination. Your reservation includes access to free Wi-Fi, a washer/dryer, two kayaks and one tandem (double) kayak with life vests. Feel free to bring your pet along, you’ll find lots of great walks and swimming spots in the area; a nominal pet fee will apply. Stroll down the street to launch the kayaks and enjoy the natural beauty of Fletcher Bay. Or pay a visit to the enchanting Bloedel Reserve, a 15-minute drive away. The Grand Forest is a close drive for miles of hiking. Head into town to discover wineries and distilleries within 2 miles of your door. When you’re ready to venture into the city, catch the ferry—less than 5 miles away—to downtown Seattle and explore historic theaters, bustling shopping centers, noteworthy restaurants, and the world famous Pike Place Market. We make it easy to stay with us! Drive straight to your rental and access the home with your unique lock code. When you book, we will send you our mobile app with directions and home instructions. We’re available 24 hours a day with live help. Pros: great comfortable beds, firewood for stove, great kayaks !!! Cons...absolutely no window coverings in living room area Leaving us with no privacy in the evenings The guest bathroom in the hallway shower wasn&#x2019;t functioning. Management or cleaner really should know these things before someone rents the property. I only rented the house for the use of the kayaks which was a delight ! Otherwise I would next time stay closer to town and the eateries & coffee shops. All in all it was good. We enjoyed our stay, and enjoyed the house. This is a wonderful rental in the Fletcher Bay area of Bainbridge. It's a nice size and the master bedroom was larger than I expected it to be based on the pictures. It's also nicely updated. The yard is large and treed. We spent most of our time sitting on the chairs out front. It's also a short walk to the water. A short drive to Battle Point park and only about a 10 minute drive to the grocery store, downtown Winslow, and the ferry. It's worth noting that the home has a rather small water heater, so you'll want to coordinate showers. Other than that, a great place to stay and we'll be back! Clean and spacious home. Kayaks were well maintained and easy to get to the water. We had a great stay! Absolutely spotless home with a great fully fenced yard for the dogs. Perfect location about 10 mins to the ferry. Great experience! All TurnKey Vacation Rentals follow local and state tax rules. City and state taxes will be added to all reservation rates. Each reservation also requires a cleaning fee, and the standard Property Damage Protection policy.